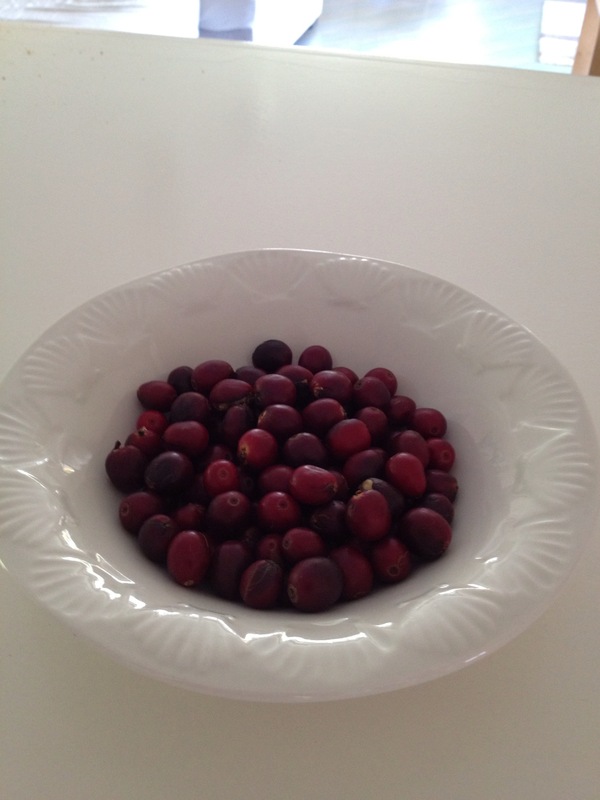 While the above title may sound rather exotic, the reality is I have been lucky enough to be given a small, recently harvested crop of beautiful red coffee ‘cherries’. Receiving such a gift carries significant responsibility, and I am determined to process, roast and cup the resulting brew with all the dedication and care I can muster. As regular readers will know, I have been roasting at home for some time now (purchasing green beans online), however to this point have not processed beans straight from the tree. This is a whole new ball game for me. How to proceed? 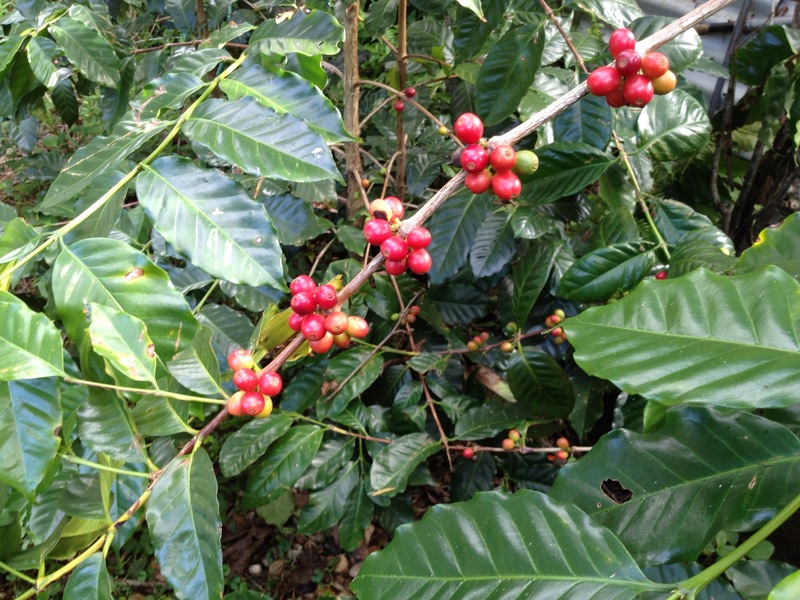 The first step was a call to my parents, who grow, and therefore regularly process, roast and drink their own crop. Next, an internet search to see what is out there on this topic. I was surprised to find the most helpful instructions on my state government’s Department of Agriculture, Fisheries and Forestry website. For additional reading on the types of processing methods, the International Coffee Organisation (ICO) provides a good summary. Firstly, there are two options, wet or dry processing. What follows in the section below outlines the wet processing method I plan to use, said to “better preserve the intrinsic qualities of the bean”. This method is the one outlined on the state government website, and also the one my parents use. The dry method is used for about 90 percent of the Arabica coffee produced in Brazil, most of the coffees produced in Ethiopia, Haiti and Paraguay, as well as for some Arabicas produced in India and Ecuador. Almost all Robustas are processed by this method. 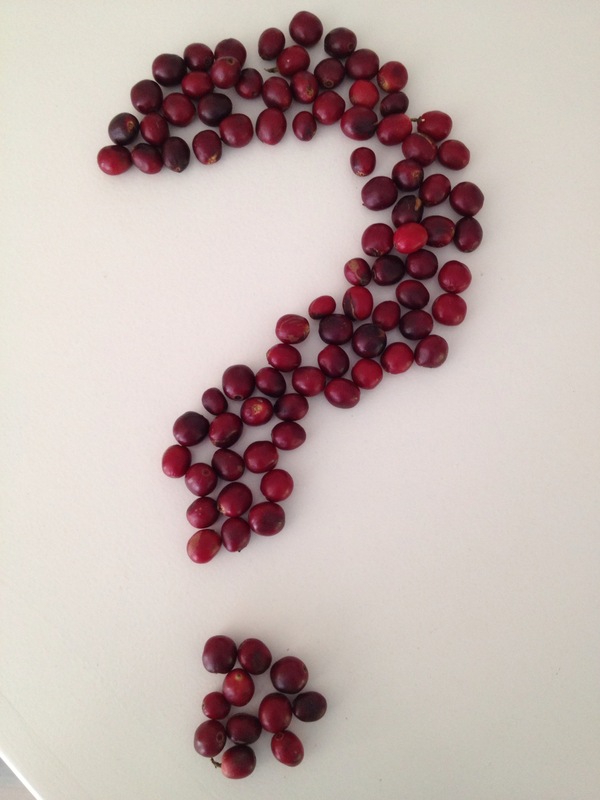 The wet method is generally used for Arabica coffees, with the exception of those produced in Brazil and the Arabica-producing countries mentioned above as users of the dry method. It is rarely used for Robustas. Comparing the method my parents use with those online saw many similarities, with only some of the time frames differing a little in each stage. We will focus on steps 1 to 4, as other posts deal with roasting, grinding and brewing, and in any event, steps 5 and 6 occur independently of the processing method used. Today we will look at Pulping and Fermentation, and return in future posts as my drying process proceeds. Here we are removing all of the skin and pulp (flesh) from the cherry, and extracting both halves of the coffee ‘seed’ from inside, and should occur as soon as possible after harvesting. Be sure to discard any underripe (green) or overripe (black) fruit which will reduce the quality of what ends up in the cup. Seed extraction in the pulping phase. This process can either be done by hand (squeezing each cherry between your thumb and finger), or in the bottom of a bucket using a piece of wood to squash the fruit, resulting in the seeds being forced out from the flesh. 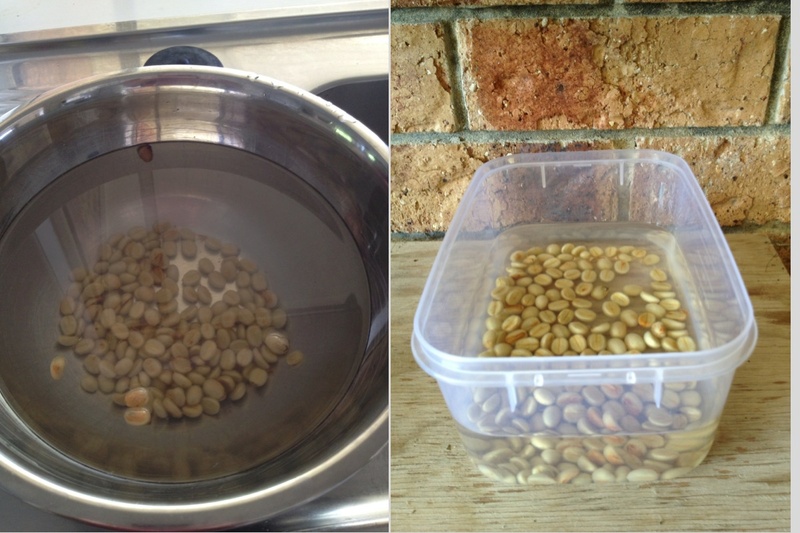 Adding water will then allow removal of the skins and one other critical element – any floating beans. Good coffee beans will not float, and those that do should be discarded as they are unusable, and will spoil the batch. There is not a lot to say about this step, apart from the fact it should last anywhere from 18–48 hours to a few days, and involves natural enzymes breaking down the ‘mucilage’ (the outer slippery substance) around the parchment layer. 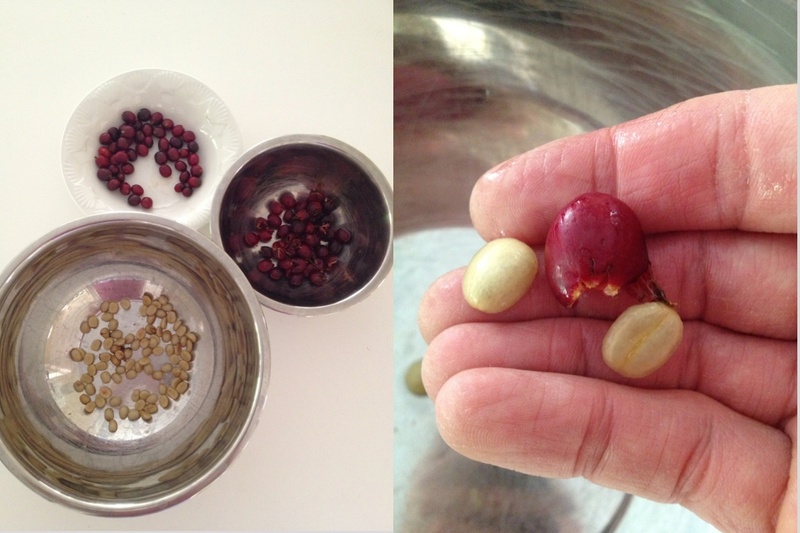 Removal of floating beans (left); fermentation (right). Fermentation should be done in a plastic bucket or container (metal may affect the taste), with the entire bean mass covered by water. To test for completeness of this phase, washing a small amount of beans should see the ‘slippery’ coating disappear, resulting in a clean, gritty feel. If so, agitate and wash the remaining beans until he water is clear (again removing any that float), which may take several washes. Once washed and clean, the beans are then ready for drying.